CellularStream.com Blog: Latest myTouch on T-Mobile- fastest Phone yet? Latest myTouch on T-Mobile- fastest Phone yet? 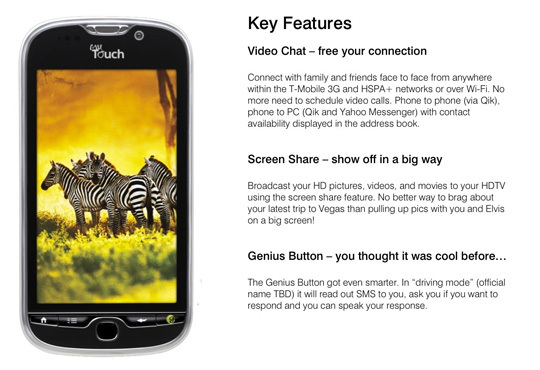 [Sponsored link] Get a myTouch 3G from our store. This soft lunch (and I mean soft when I say that I could not find a lot of mentioning online) of the next generation of the myTouch introduces a phone with a 3.8" screen, a MSM8255 1 GHZ Snapdragon processor a HSPA+ 4G connection speeds. No phosocal keyboard- and if you need one you can always go for the G2. There is no doubt that this is one of the fastest phones out there, having the same CPU as the Desire HD but with 4G connectivity I might risk it and call this the best phone till now. Packed with some of the latest standards (5MP camera, HD recording) the phone will have some new features and it will support cellular face time along with live video/media streaming. Overall this sounds like the Android world has got a new competitor for the title and it will come in 3 colors too.